This product has been viewed 753 times. 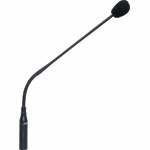 can be configured for either microphone or auxiliary use, whilst the last two are for dedicated auxiliary use. 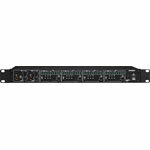 Along with this, the amplifier provides 6 output zones with individual in-built attenuators. Each zone is able to be activated on or off via the front panel switches. LEDs indicate when each zone is selected. All zones can be selected on via the all call switch. 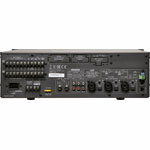 Front panel controls are provided for volume, treble and bass for each input, along with a master volume control. 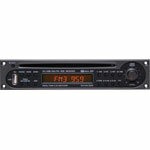 Output level is monitored via the front panel LED VU meter. Fitted with paging chime and siren tone generator. 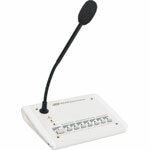 A telephone paging input is also included. 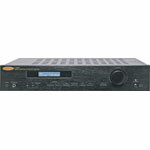 The front panel has provision for fitting optional modules such as, A 4344 tuner or A 4346 CD/MP3 player. Operation is from either 240V AC or 24VDC. 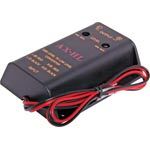 A closing set of contacts enables remote ON/OFF control of the 240V. 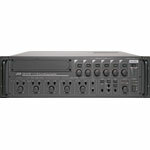 Other features include record out socket, pre amp, in/out socket to feed other power amplifiers or insert other effects equipment such as a graphic equalizer. 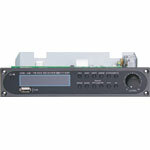 The addition of the optional A 4353 6 zone paging microphone and A 4352 control PCB, enables paging to each or any combination of speaker zones remotely.